Show your appreciation this year with a gift they will enjoy and remember! Temporary Employment agencies, and staffing firms – this could be very useful for you. Each year, in April – we celebrate Administrative Assistants’ week! Get an early start this year on organizing gifts for your administrative assistants and for admin assistants at client offices. Your administrative assistants are so good about doing everything for you! Now is the time to show your special appreciation this year with a gift they will enjoy and remember! And we’ll make it easy: we’ll take care of everything for you! You can take them out to lunch – and then present them with one of these awesome gifts. Last year, we suggested this idea to a client of ours, that had consultants posted at various client locations. They ordered gifts – with their logo imprinted – for all the administrative assistants at their client locations. Talk about a huge success. Not only did the admin assistants love the gift, the consulting company’s logo was proudly displayed for days after. Talk about a neat way to spread goodwill – and subtly do a one-over on the competition. Tilt the playing field … in your favor, baby. Yeah, that’s what we’re talking about! 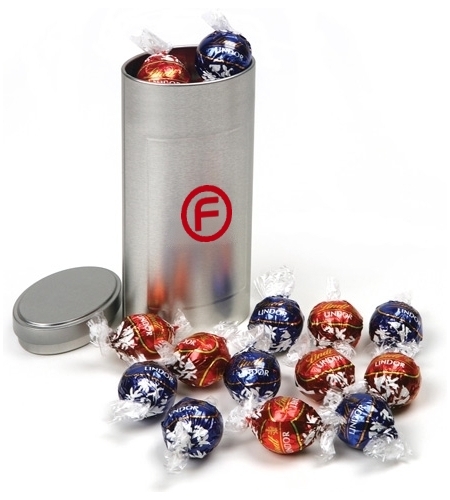 This stylish tin is filled with one-dozen individually wrapped, creamy, Lindt-Lindor Chocolate Truffles; half Milk and half Dark Chocolate. For a final touch your logo is pad printed in one of eight standard colors on this nice, useful and re-usable tin. We can also custom-match to a specific Pantone or PMS color in your logo for an additional charge.